PLEASE JOIN US FOR THE January Thaw......Tunes, community, dance, food to warm up your heart! Admission: Suggested Donation for workshop $20 concert $10 - $20 (both $25) Jamming & Potluck free. 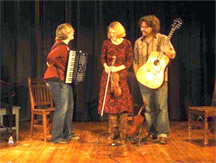 Eloise & Co., based in Brattleboro, VT, and Syracuse, NY, is a powerhouse trio currently touring the country to perform at concerts, contra dances, French folk dances, and festivals. Becky Tracy, Rachel Bell, and Andrew VanNorstrand crank out driving Celtic reels, achingly beautiful waltzes, gritty French groove tunes, jovial French Canadian melodies, and exciting originals, all delivered with just the right balance of precision and raw energy. These three seasoned performers also delight in crafting fresh new arrangements of old traditional songs, often inviting the audience to sing along. Their debut CD, “More, Please!” was released in July, 2018, and has quickly garnered praise and popularity among listeners from many different walks of life. You are invited to come and experience, up close and personal, the magic and joy that this trio feels when playing together. Please join us! 3:00 PM - Open OldTime / Northern Jam session (w/some courtesy to OT Banjo players who would like to stay in one key for more than one tune). 5:00 PM - Potluck sponsored by the Landmark Society. The society will provide Chicken, Pizza, Coffee & Water provided. Bring Side dishes or Desserts. 6:00 - 7:00 PM - Workshop… Eloise will teach a simple (square) French Dance tune from either Brittany or Central France (distinct from French Canadian music in that these tunes are from France, across the pond). At the end of the workshop they will demo the dance that matches the tune & get people up dancing to this traditional tune with Workshop attendees playing. 7:30 - 9:30 PM - Concert ELOISE & CO.
? 9:30 - ?? Open Jam. Songs, Tunes, if the energy is still there! Please use the mailing address: P.O. Box 1021, Bradford, PA 16701. There is no mailbox at the Crook Farm Homestead on Seaward Ave and the East Corydon Street address is not to be used except for large packages.